This uncommon name is of Anglo-Saxon origin, and is a topographical surname for someone who lived by a hill or ridge, a "how". 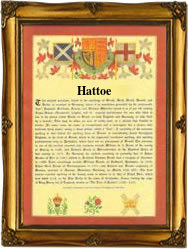 The name derives from the Olde English pre 7th Century "aet", at, with "hoh", heel, projecting ridge of land, crag, cliff, which became in Middle English "atte hoe, hough", or "heugh", giving the modern surnames Atto, Attoe, Atthowe, Hatto and Hattoe. Similarly formed names include: Athey, from the Middle English "hay, hey", enclosure; Athill, "dweller at the hill"; and Atwell, rom the Middle English "well(e)", spring or stream. Topographical surnames were among the earliest created, since both natural and man-made features in the landscape provided easily recognisable distinguishing names in the small communities of the Middle Ages. Early examples of the surname include: Philip Atteho, in the Kent Hundred Rolls of 1273, and William Attehow, recorded in the 1286 Norfolk Feet of Fines. Among the recordings of the name in Church Registers are those of the christening of John Hatto on May 8th 1602, in Heckfield and Mattingley, Hampshire, and of the marriage of John Hatto and Alice Puckerige, at the same place, on September 9th 1602. The Coat of Arms most associated with the name depicts a silver chevron between three silver carpenters' squares on a black shield. The first recorded spelling of the family name is shown to be that of Roger Atteho, which was dated 1236, in the "Feet of Fines of Sussex", during the reign of King Henry 111, known as "The Frenchman", 1216 - 1272. Surnames became necessary when governments introduced personal taxation. In England this was known as Poll Tax. Throughout the centuries, surnames in every country have continued to "develop" often leading to astonishing variants of the original spelling.